Perfect accessory to my knitting bag. Great quality. #Knitroverts are flying their flags all around the world. Pre-orders for our next release are available now - get yours today! Maker @FiftyFourTenStudio has amazing designs to share with our community. 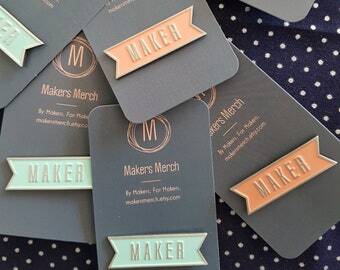 Get your Maker Community Member pin and share your Maker pride! 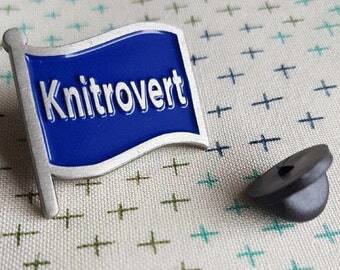 Are you a Knitrovert (a knitting introvert)? This collectible flag is for you! Let your flag fly! #Knitrovert. Pins are not just for project bags! Makers Merch was founded in 2017 by Kelly and Marce as a North American brand with a global reach. We have a passion for all things fiber and fabric. This has given us countless connections and friendships around the world, and our aim is to strengthen those connections in the Maker Community. The mission of our brand is to provide unique, high quality merchandise crafted by Makers, for Makers. We'll continue to offer fresh, fun, and functional products, with styles for everyone, regardless of your favorite crafts. Over time, Makers Merch will extend its connections to meetups and events with a goal of bringing us all even closer together. The first set of collectibles is available now. Get yours today! We found friendship in stitches; this brand honors that connection. A passion for yarn, fabric and the joy of Making is one we love to share. Kelly hails from picturesque New Brunswick. Marce lives in sunny South Florida. By Makers, for Makers.